This is one of my favorite pasta dishes. It’s only got a few ingredients but it packs a lot of flavor (if done correctly) and is great for summer entertaining. I think some people might be intimidated about buying clams and cooking them, especially if it’s your first time, but it’s really quite easy and if you follow a few steps you can ensure that you have a grit free, tasty pasta! I used middleneck clams because that’s the only ones they sold at Fresh Market, but littleneck clams work too. The main thing to look for when you buy clams is that they are closed. If they are slightly open but close quickly when you tap them then they are still alive and they’re good to go! If they are open and don’t shut, discard them. When you buy the clams, your fish monger should check this for you. Also, check to make sure you don’t have any cracked or chipped clams. 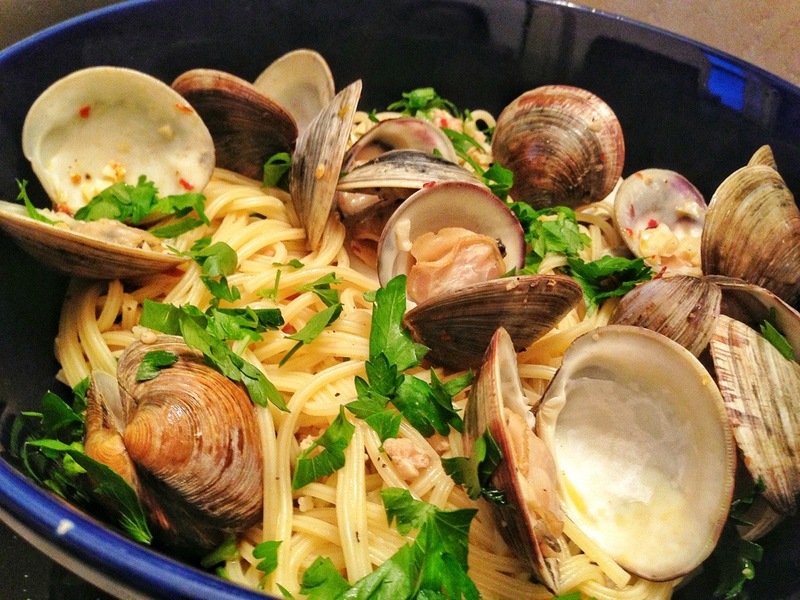 About 20-30 minutes before you decide to make dinner, soak your clams in some cool, fresh water. The clams will naturally filter out any sand or grit inside. After soaking, scrub the outside as well. If you notice a particularly large amount of sand at the bottom of your bowl you can repeat this process more than once. I like to also use a can of chopped clams in addition to the fresh clams because I like to taste clam in every bite! That’s the point, isn’t it? While your pasta is cooking, in a large saucepan heat up the olive oil and crushed red pepper over medium heat. Add the garlic and cook for a few minutes. Add the clams (canned and fresh) and the white wine and cover. The clams should take about 5-7 minutes to open. Stir them around in the sauce so that the clams take on the flavor of the sauce. Taste the sauce and add a bit of salt if needed. Once the clams have opened fully remove them and set aside. If you have too much liquid at this point, keep cooking the liquid down a bit. It’s ok to have a decent amount of liquid. Your pasta will soak it up! With a pair of tongs, place the pasta in the pan with the sauce and mix over low heat. Add the chopped parsley and some pepper and fresh olive oil. 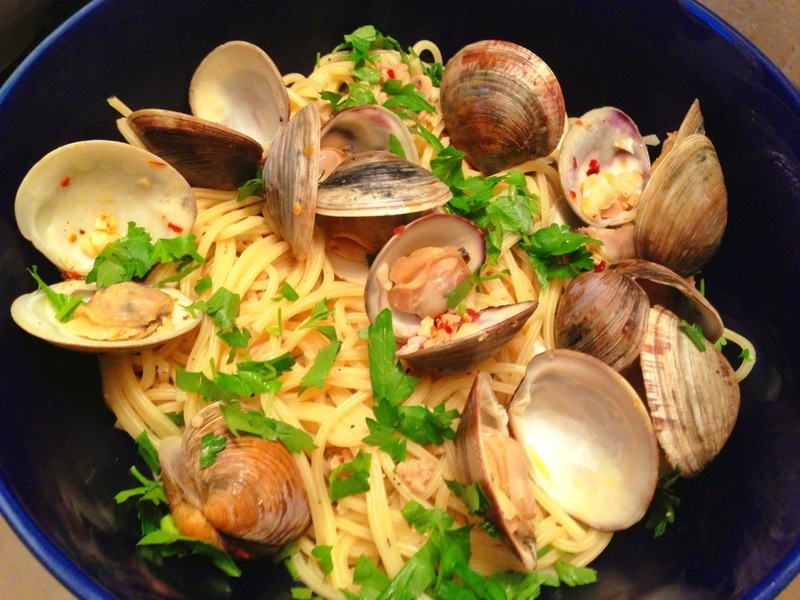 In a serving bowl combine clams and pasta and mix thoroughly. Garnish with some parsley. I like to finish the dish with a little butter, swirled into the sauce, creating an emulsion that adds a nice smooth texture and pleasant rounding of flavor to the sauce..